West Coast imports handle almost 50% of all U.S. maritime trade and more than 70% of the country’s Asian imports. The recent resolution to the West Coast import crisis came none to soon and on the surface, America averted a disaster of monumental proportions with regard to the settling of the West Coast port labor dispute. However, if Americans think they have totally averted disaster in the long-term, they are sadly mistaken. The backlog of goods will take weeks to months to offload. The impact on our economy will be felt for years and the severity of the crisis was completely avoidable. The settlement may have come in the nick of time to avert an economic collapse, in the near term, however, America is not escaping unscathed from the import crisis. Los Angeles and Long Beach port officials said “It will take weeks, if not months, just to clear the current backlog“. The dispute has reverberated throughout the U.S. economy, extending to agriculture, manufacturing, retail and transportation. The crisis has even hit consumers of French-fried potatoes at McDonald’s restaurants as far away as in Japan. Everyone from automakers to meat exporters are impacted by the failure of goods to flow from the ships to the retail outlets. American consumers can expect to pay more for a car this summer as automakers were forced to turn to more expensive air freight to get parts to North American assembly lines. Japan’s Honda Motor said its Ohio plant would resume full activity by today (Tuesday) but its plants in Canada and Indiana would be kept at a far lower production level. This leads to layoffs at a time when the U.S. and Canadian worker cannot afford another attack upon employment rates. The backup at the West Coast ports cost Honda about 25,000 vehicles in lost production this month. Along a similar vein, Toyota and Nissan have reduced total man hours at its plants. Wal-Mart is reporting that the delays have caused spot shortages and that potential earnings have more than likely have been reduced which could result in lost jobs. Americans can expect to pay more for beef in the upcoming months. U.S. meat exporters have had to put millions of pounds of beef and pork into cold storage and ship by air or use Canadian or Mexican ports. Food giants, such as Tyson Foods are among the leading U.S. pork and beef producers that had to fly its meat products to cold storage facilities in Mexico. Hold on to your wallets America when it comes to food prices and this comes at a time when one in six Americans are already experiencing “food vulnerability”. As it seems to be with all economic crisis, the farmers take the worst of it and the impact shows up in the form of higher food prices. This import crisis has the potential to wreak havoc on the American food consumer as it is estimated that California farmers lost hundreds of millions of dollars in rotting crops at the ports and lost food production resulting from the crisis. This has a ripple effect through the economy resulting in a loss of food production jobs as well as food transport jobs. In summary, American consumers can expect to pay far more for food and other essential commodities as a result of the import crisis. The impact of the import crisis could not have come at a worse time for many Americans who are experiencing extreme financial distress. A recent poll of more than 1,000 people in the United States by Bankrate.com found that 37% of Americans have credit card debt that is greater than their emergency savings. Another 13% have neither credit card debt nor emergency savings. In other words, many Americans have no margin for error. So, as the import crisis and its economic effects cascade across the country, over a third of the country has no means to weather the storm that will reverberate in the U.S. over the next six to nine months. American Express reported in a 2014 survey that emergencies are more frequent than many would like to think. Over 50% of the Americans who responded to the survey had to deal with major unforeseen or emergency expenses in the past year. Americans said these crises included unexpected health expense (44%) and auto repair (46%). Soon, we are going to be talking about food prices as the next unplanned crisis. Students are likely to impacted as well as the Federal Reserve Bank of New York reported last week that the quantity of student loans in the US overdue by 90 days or more has risen to 11.3%. Students, who are completing their studies and beginning to pay off their student loans have no margin for error. The victims are being lined up and soon they will be mowed down by economic forces beyond their control. The import crisis on the West Coast began in May of 2014. The Obama administration did not attempt to intervene until less than a 10 days ago. when Obama dispatched Labor Secretary, Thomas Perez, to California to resolve the crisis. 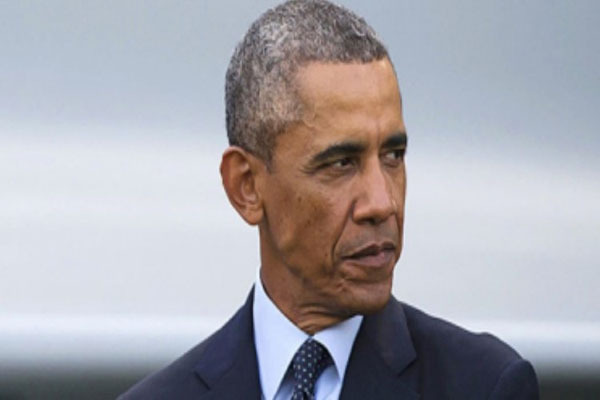 With the American economy teetering on the brink, Obama knew he had little wiggle room to get this crisis solved and we should all be asking why he did not act for nearly nine months! Investment watch is reporting that about 20% of all suicide deaths can be attributed to unemployment concerns. Investment Watch cites a survey from a team of researchers from the University of Zurich’s Psychiatric Hospital who found that suicides attributed to unemployment were nine times higher than the number of suicides attributed to the economic crisis downturn. Under Obama the youth misery index has grown over 50%. National debt per capita for 2014 is the highest it’s ever been at $58,437. Young people will be stuck paying for government debt they had no part in creating as the sins of the father are visited upon the son. All of this comes at a time when King World News is proclaiming that the world is ready to enter a period of “immense financial destruction and social disorder”. 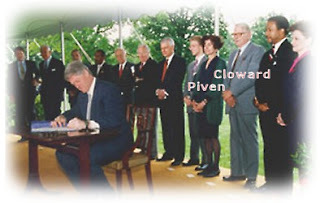 Cloward and Piven were present at the signing of NAFTA which remains as the single most destructive event in American economic history. The realization of the Cloward and Piven plot has been a long time coming and Obama is the right man at the right time to implement their “Rules for Radicals”. Please allow me introduce you to the people whose writings inspired Obama to complete the task of collapsing of our economic system, Richard Cloward and Francis Fox Piven. Cloward and Piven authored the Cloward-Piven strategy which has been a long time coming and is fully in place in the United States. Both publications were inspired by their belief in “social justice and fundamentally transformative change in America.” Interesting choice of words. Where have we heard these terms before? Didn’t Obama say something about fundamentally transforming America? Inspired by the riots in LA in 1965, Cloward and Piven wrote and published their article which outlined the best way to bring the kind of extreme radical type of social change was to economically destroy America. In their estimation, the plan was designed to overwhelm the system and bring about the fall of capitalism by overloading the government bureaucracy with impossible demands and bring on an economic collapse mostly accomplished by the imposition of a massive welfare system made necessary by a contrived failing economy. Obamacare is turning America into a nation of part time workers to avoid the regulations and taxes associated with the program and this will undoubtedly bankrupt most small businesses. I would call our present economic crisis a contrived economic failure. Cloward and Piven instructed activists that if a crisis did not exist, promote or manufacture one by exaggerating some threatening predicament. Global warming and healthcare would certainly fit the description, wouldn’t it? There are presently 97 million full-time working Americans as compared to 101 million Americans receiving some form of welfare. One would have to conclude that Cloward and Piven eventually achieved their goal of overwhelming the American economy through Obama’s presidency. Ask yourself a question America, what business could survive with only half of its employees producing anything? One third of all Americans are in economic crisis and have no margin for error. America is on the verge of seeing unparalleled economic misery among a great number of people. What is coming will not be the Great Depression, but as Gerald Celente likes to call it, “The Greatest Depression”. In volatile times such these, we cannot always see the economic death blow coming. However, the perpetual assault upon America by Obama (e.g. Obamacare, bail-outs, etc.) it is clear that Obama is invoking Cloward and Piven’s strategy of overwhelming the system from within in order to collapse the system. And what follows? Hell on earth awaits this generation of Americans and its formal inception is right around the corner.